Portuguese dark metal outfit Moonspell is supporting eleventh studio album "Extinct" (reviewed here), a monument erected to the realm of gothic music. The band is pleased to announce its return to North America, sharing the stage with symphonic metal legends Epica. Support will come from Starkill. The tour starts January 21 in New York, NY and wraps up with an appearance on the 70,000 Tons of Metal Cruise. A list of all dates can be found below. 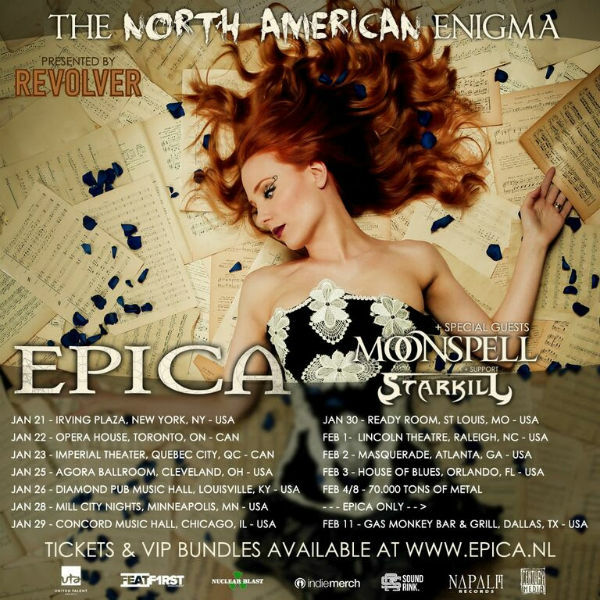 Moonspell frontman Fernando Ribeiro commented on the upcoming tour: "We are thrilled to return the US, alongside our friends in Epica. This will be our first tour of the year so we will for sure celebrate with our American and Canadian fans. It is a real honor to share the stage with Epica. We will be sure to haunt this tour with our absolute Portuguese darkness. Under the spell!" 1 Comment on "Moonspell Announces Tour Dates With Epica"
Cool. Hopefully, this time I'll be able to catch Epica, since the MachineHead tour got cancelled, then they had to cancel some dates of their headlining tour with Eluveitie and The Agonist. I was really disappointed to hear that one. This should make up for it though.